Imagine living in Halifax and not having enough to eat. Or going to sleep at night with your belly rumbling, and wondering if you even care to wake up to live another day. For our neighbours in need, Souls Harbour Rescue Mission is a true lifeline. Souls Harbour serves over 50,000 hot, nutritious meals every year to an average of 150 men, women and children each day. They rescue people from poverty, addiction and despair, by offering emergency help, such as food and clothing, life-changing programs, and the message of the Gospel. Souls Harbour are also social media experts of a sort, having used Facebook and Twitter to build their organization by, not once but TWICE winning the Aviva Community Fund Grand Prize of $100,000! Michelle Porter, CEO, has even gone on to mentor others vying to win social media voting competitions. • Conducting daily countdowns with vote count updates. Recently Souls Harbour announced the opening of a 17,000-square-foot thrift store – Mission Mart – in Bayers Lake in October 2018. The store will train people in jobs like stockroom management, janitorial work, customer service, merchandising and cashier. Plus a cafe will train people in food services. Employees will be recruited from among the people currently being served by the mission. 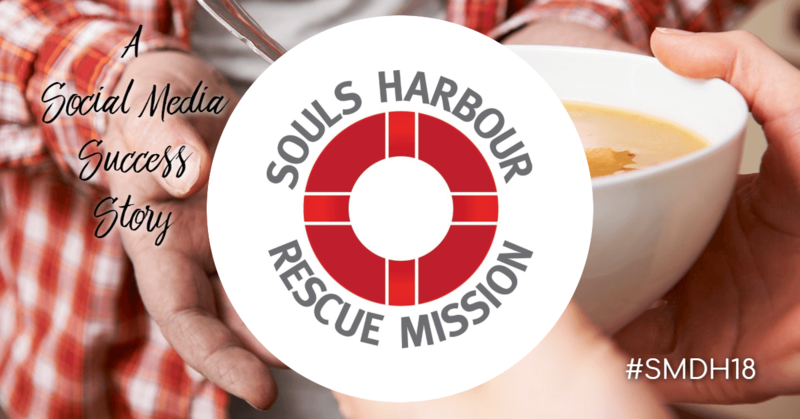 We’re so pleased that Souls Harbour Rescue Mission decided to join us this first year for Social Media Day Halifax. If you’d like to support Souls Harbour, check out their latest fundraising efforts Ride for Refuge, where they’ve set a goal of raising $25,000.